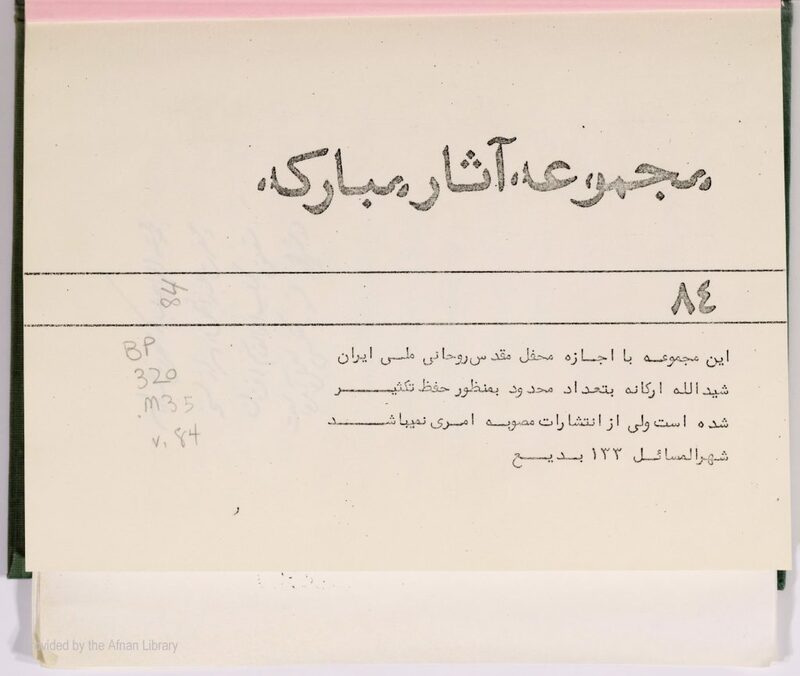 Description: Collection of Tablets of Baha’u’lláh and `Abdu’l-Baha addressed to Bahá’ís of Shiraz and Fars. Except for the last 12 pages of the manuscript which are separately numbered and appear to have been bound in later, all of the Tablets in this collection are individually numbered, 1-958. Many have identifications of the recipient, the date, and the handwriting of the original Tablet. The volume has been divided into separate sections with page numbers running on. Vol. 1: Tablets of Bahá’u’lláh, pp. 1-117; Vol. 2: Tablets of Bahá’u’lláh, pp. 118-237, in a different handwriting to Vol. 1, handwriting changes again on p. 174; Vol. 3 (Called Vol. 2 in the text): Tablets of `Abdu’l-Bahá, pp. 238-551; handwriting changes on p. 495; appended to the end are 12 extra pages separately numbered pp. 483-494. Manuscript 551 + 12 pp. (571 pp. of PDF).